Background & Objective: The innate immune response is a common occurrence in many neuroinflammatory diseases. Central Nervous System (CNS) resident immune cells are able to detect and react to infections and sterile trauma. Peripheral immune cell migration into CNS is regulated by the blood-brain barrier, although peripheral immune cells can invade CNS through meninges, choroid plexus, perivascular spaces, and cerebrospinal fluid. Consequently, in the brain, immune reactions can be mediated by both resident and peripheral immune cells. Both in the periphery and within the CNS, innate immune response is regulated by a wide array of pattern recognition receptors, including Tolllike, scavenger, Retinoic Acid-inducible Gene-1 like, and nucleotide-binding oligomerization domainslike responsible for inflammasome formation. Inflammasome pathway activation induces pyroptosis, a highly inflammatory cell death pattern that occurs to remove intracellular pathogens. Legionella pneumophila is an intracellular microorganism responsible for Legionnaires' disease, a lung infection always associated to neurological dysfunctions. Recent studies have been shown that Toll-like receptors, nucleotide-binding oligomerization domains-like receptors, and RIG-1 like, are activated by L. pneumophila. This flagellated bacterium is able to replicate in phagocytic cells, including macrophages and microglia, responding by activating inflammasome pathways that may be the cause of CNS dysfunction detected in several infected patients. Conclusion: The aim of this review is to bring together the latest findings concerning L. pneumophila infection and innate immune host cell responses. 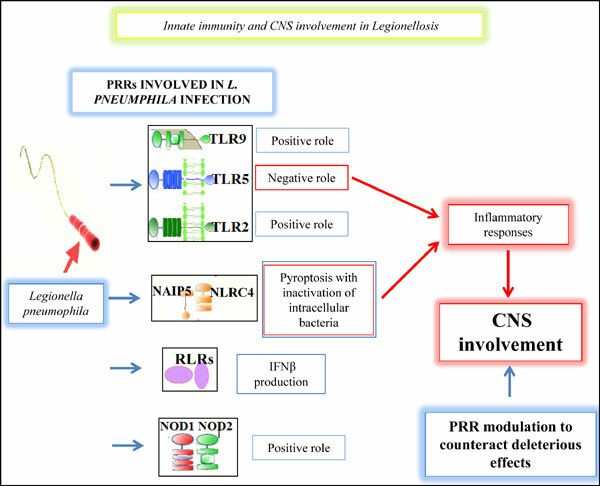 A deeper knowledge of these processes could allow the use of immunomodulatory compounds able to counteract CNS involvement following L. pneumophila infection. Keywords: Central nervous system, inflammation, innate immunity, legionnaire’s disease, Legionella pneumophila, pattern recognition receptors. Keywords:Central nervous system, inflammation, innate immunity, legionnaire’s disease, Legionella pneumophila, pattern recognition receptors. Abstract:Background & Objective: The innate immune response is a common occurrence in many neuroinflammatory diseases. Central Nervous System (CNS) resident immune cells are able to detect and react to infections and sterile trauma. Peripheral immune cell migration into CNS is regulated by the blood-brain barrier, although peripheral immune cells can invade CNS through meninges, choroid plexus, perivascular spaces, and cerebrospinal fluid. Consequently, in the brain, immune reactions can be mediated by both resident and peripheral immune cells. Both in the periphery and within the CNS, innate immune response is regulated by a wide array of pattern recognition receptors, including Tolllike, scavenger, Retinoic Acid-inducible Gene-1 like, and nucleotide-binding oligomerization domainslike responsible for inflammasome formation. Inflammasome pathway activation induces pyroptosis, a highly inflammatory cell death pattern that occurs to remove intracellular pathogens. Legionella pneumophila is an intracellular microorganism responsible for Legionnaires' disease, a lung infection always associated to neurological dysfunctions. Recent studies have been shown that Toll-like receptors, nucleotide-binding oligomerization domains-like receptors, and RIG-1 like, are activated by L. pneumophila. This flagellated bacterium is able to replicate in phagocytic cells, including macrophages and microglia, responding by activating inflammasome pathways that may be the cause of CNS dysfunction detected in several infected patients.